Pinner Throwback IPA is an American beer, it has an alcohol content of 4.9%. How do you cram as much hop & malt flavor and aroma as possible into a beer but make it crushable too? 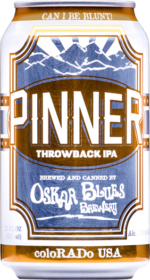 That’s the challenge Oskar Blues answered with Pinner Throwback IPA. At 4.9% ABV and 35 IBUs, this drinkable IPA uses several varieties of hops to target the ever-evolving flavor. With tropical fruits, citrus juices, pineapple and spice berry up front in the aroma and flavor, the biscuit & toasted bread at the back balance out all the hops and make a great finish to go on to your next can of Pinner. It’s the perfect beer for a little sip, sip, give.